They are at either end of the size scale, yet two key Melbourne developments are beginning to show their wares. Both Australia 108 and South Melbourne Primary School have received their first exterior finishes over recent weeks, providing the passersby with a glimpse at the final product which is still some time away, particularly in the case of Australia 108. 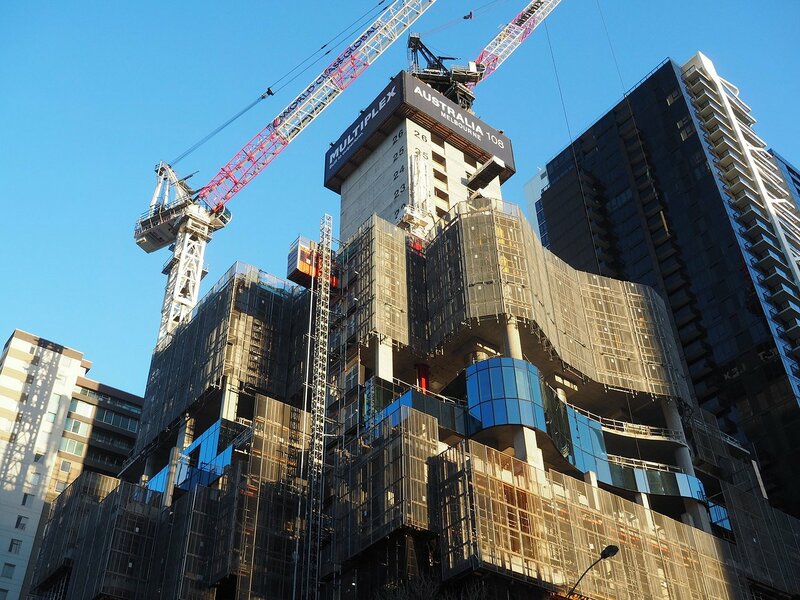 Melbourne's soon-to-be tallest tower situated on Southbank has received cladding over the first habitable floor above its podium, allowing fit-outs to begin on the first of the tower's one thousand plus apartments. The highly reflective, blue-tinged facade will be continued for the height of the massive building, save for intermittent white bands and the gold coloured 'starburst' that will break the blue monotony of the tower. Australia 108's facade is highly complimentary to nearby neighbour Eureka Tower, with Fender Katsalidis the presiding architect for both projects. Blue, white and gold elements are present across both towers, although Australia 108's podium will be markedly different. Later in its construction, Australia 108's tiered podium will receive mature planters, greening and softening the lower levels relative to street level. Currently level 27 is in Australia 108's jump form, equating to roughly 80 metres in height; still well short of the tower's ultimate height of 319 metres. At the other end of the scale, South Melbourne Primary School (as it's known for now) is also receiving bursts of colour across its facade, albeit on a much smaller scale relative to Australia 108. Pops of pink have appeared across both its eastern and western flanks, as the exterior cladding continues to be rolled out over Fisherman's Bend's first school. Architecture firm Hayball's design for the vertical campus won the Future Project of the Year at the 2016 World Architecture Festival. Hayball have in the past described South Melbourne Primary School design as an outcome of research and the open exchange of ideas and different ways of thinking. The vivid colours across the building's facade will be opposed by the more sedate curtain finish which is being applied to the building's northern frontage. At its northern interface the building will eventually transition into an open, landscaped area for public use. 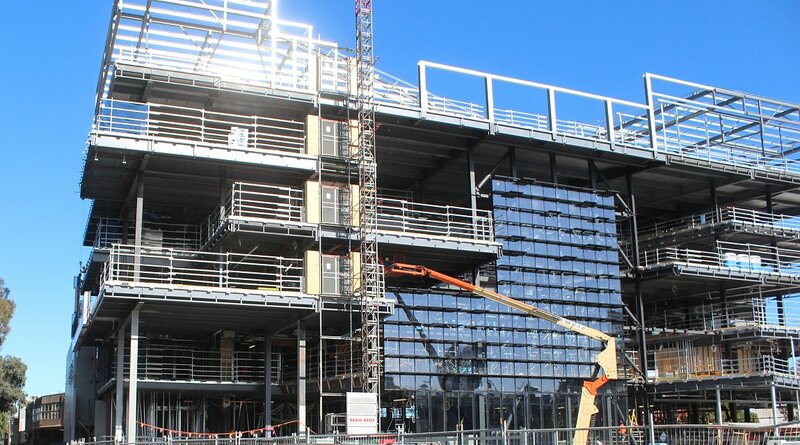 Completion of South Melbourne Primary School is due prior to the beginning of the 2018 academic year whilst Australia 108's final handover is slated for mid 2020.